Cabin shock absorbers take in impacts, thereby providing suspension to the cabin. 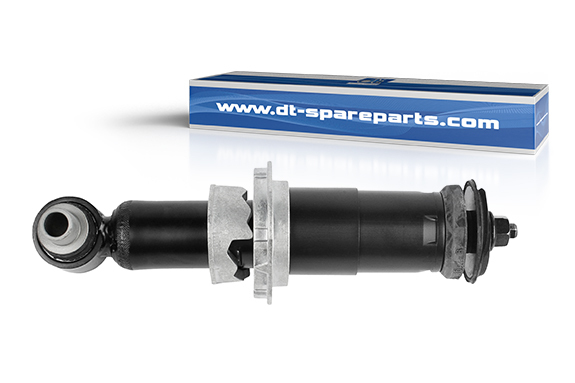 DT Spare Parts cabin shock absorbers are designed for 10 million cycles and are characterised by high corrosion resistance. They were tested over 500 hours in a salt spray test. Cabin shock absorbers are designed for the respective vehicle type and generally consist of two components: the inner component prevents rebounding of the cabin and the outer component dampens the compression. nuts are to be renewed. The mounting torque must be maintained according to the manufacturer’s instructions so that the bearings do not become distorted. After installing the new items, the cabin shock absorbers and driver’s cabin must be straight. The shock absorbers can be optimally adjusted using the setting rings. If necessary, the driver’s suspension must be calibrated.